I made this recipe up after watching the chefs make it at the restaurant I used to work at. It was wildly popular with the customers, of course the recipe they used was HUGE so I had to kind of figure out what exactly they put in it in exactly which amounts. Saute one medium(ish) diced onion in a pan with approximately 1/4 C olive or grape seed oil. 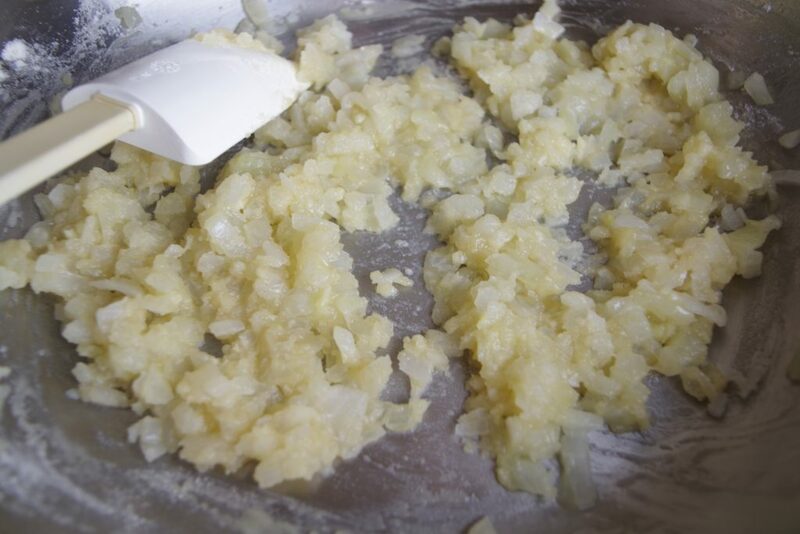 Add 2 cloves of crushed garlic and 1/8 C. flour and cook for a minute or two. Add 6 C of water OR chicken broth. 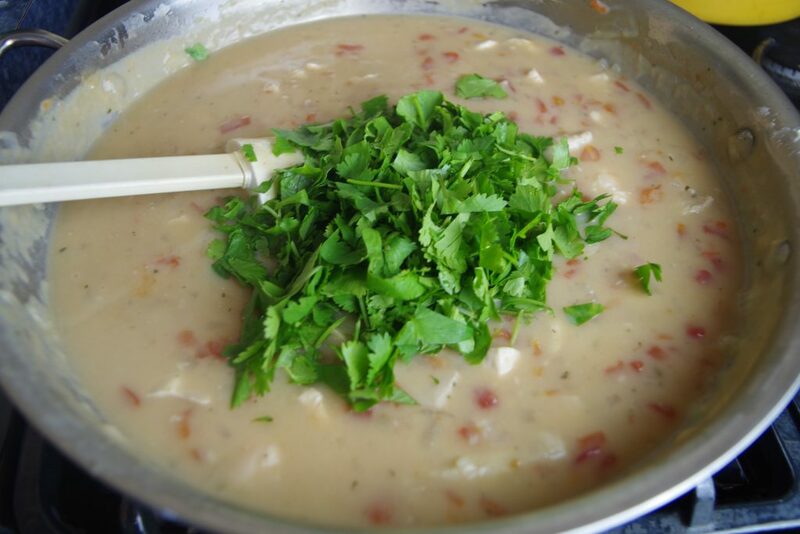 Typically I use water then adjust the flavor with 1 or 2 T. of chicken base at the end of cooking. This allows me to adjust the flavor and salt at the end of cooking. Cook until thickened over medium heat. Add 2 T. cumin and the juice of one lime (I used RealLime because I didn’t have a fresh lime but it is actually better with a real lime) and a 14 oz container of canned Rotel-style tomatoes. I typically drain and rinse the tomatoes so the soup isn’t pink but it’s completely up to you if you like your soup pink. Add diced or sliced chicken and cook until the chicken is cooked through. If you already have some cooked chicken you can also slice and use it, or use 2 small or 1 large chicken breast. How you put the chicken in is completely up to you. 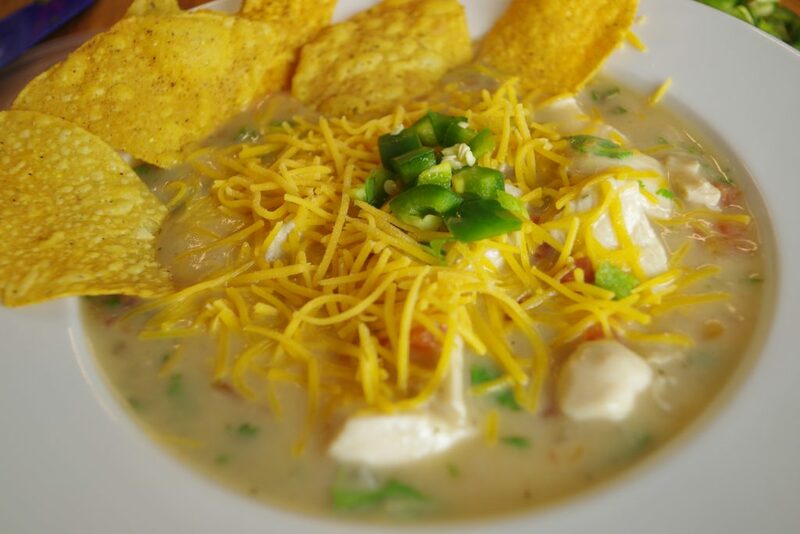 You can also add a diced jalapeno at this point if you like your soup spicy. 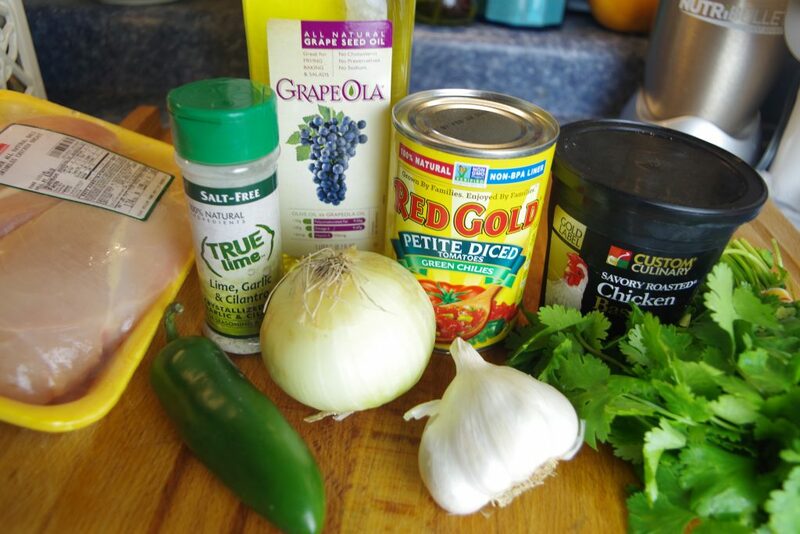 Cook until the chicken is cooked through and add some fresh cilantro. Cook for just a minute to heat the cilantro through and adjust the seasoning with chicken base if you did not use stock (or salt if you need it). 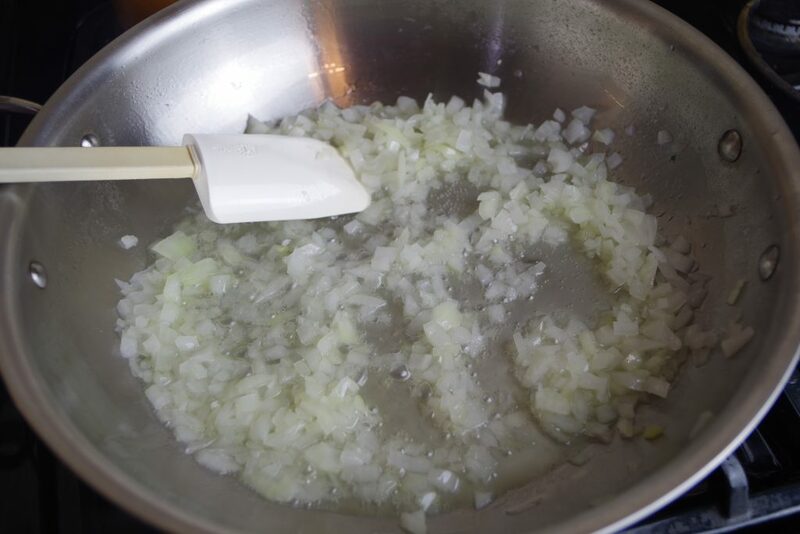 Saute onion in olive oil. Add flour and garlic and saute for a minute. Add water and cook until thickened. 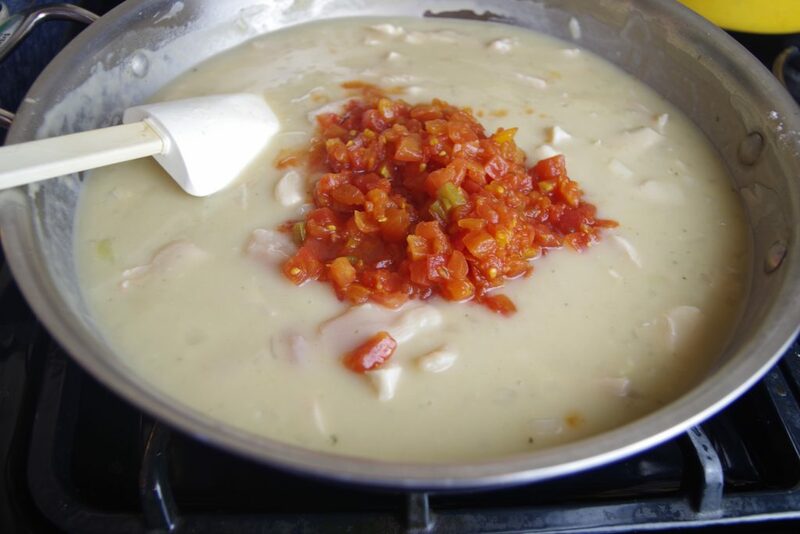 Add chicken and cook through, then add drained and rinsed rotel and jalapenos. Add cilantro and warm, then serve with cheese and tortilla strips.